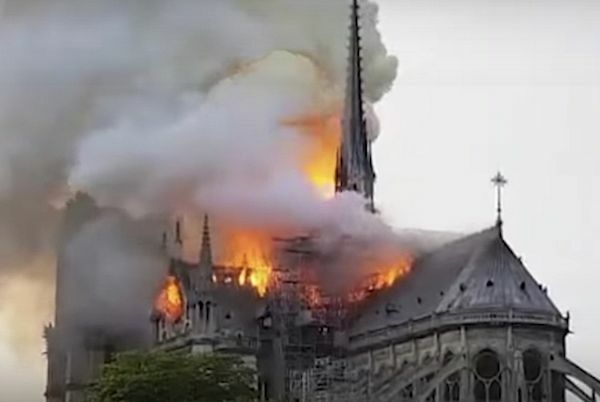 The extensive destruction by fire of Notre Dame Cathedral marks a turning-point after close to a millennium of spiritual affirmation and cultural pride, beckoning revival and a new beginning, writes media editor Dr Lee Duffield. IT CAN HARDLY be imagined that Notre Dame will not always be there; the hopes and prayers of millions will be invested already in salvaging the cherished object and rebuilding. Of all places, a great Christian Cathedral in majesty or pain will be a symbol of hope. The Coventry Cathedral building contemporary with Notre Dame was destroyed by fire in a 1940 air raid. A decision was taken the next day to rebuild it. The new structure abutting intact ruins of the old was seen at its consecration in 1962 as a triumph of modernist inspiration and a triumph of forgiveness and hope. It was the same at Dresden in Germany where the Evangelical-Lutheran church, the Frauenkirche, finished in the Baroque style, became a standing ruin during air raids in February 1945. It remained as a shell until the reunification of Germany in 1990 and the commencement of an international public subscription to raise the €218 million (AU$344 million) needed to restore it. The work committed the architects to major research to match the building methods employed there since the mediaeval era. The outcome shows a striking mix of dark-coloured retrieved stone blocks and lighter-coloured new ones. The same message is represented in another landmark, the re-built Kaiser Wilhelm Memorial Church, originally a 19th Century building where the ruined steeple dominates the Kurfurstendamn in Berlin. The famous Kurfurstendamn Boulevard became a mecca to border crossers from East Germany during the euphoric days of the opening of the Berlin Wall in 1989. The collapse of the vaulted roof of Notre Dame will create problems for any re-build of the structure. It was the classic Gothic cathedral, in its time a palace of light, the heavy stone structure raised high above the heads of the congregation — people who would hardly know any other such luxurious space. Like the Opera House in Sydney, it was a building where the expansive design had to be truncated a little because of the limitations of the site. The compensation is the thrilling aspect: Bennelong Point at Sydney Cove; the Île de la Cité, a small island in the Seine River, the heart of Paris. Early reports said that the cause of the fire in Paris might have been associated with extensive restoration work that was underway. Eyewitnesses said it went up quickly with flames leaping high throughout the structure. The BBC Paris correspondent Hugh Scofield described a “heartbreaking” scene with flames “disfiguring the Paris skyline”. In Australia, commercial television provided live images of Notre Dame on fire, an experience reminiscent of the destruction of the World Trade Centre in New York in 2001. SBS caught up after a few hours as did ABC radio. The ABC television service including the news channel at the height of it put on other material including the re-run of a talk show from the night before. There are ample resources to deliver this kind of coverage which is a strength of mainstream media. There is room for discussion here about what news is, what kind of services the public are interested in getting and what is in the public interest. Enjoyment revealing the sight for the first time to visitors, including my children, whether walking along the river bank on the Île de la Cité, or suddenly revealed when stepping around the corner of a building at the St Michel metro station. Walking the length of the building after working late at night after the floodlights went off, its hulking dark mass a reminder of its mystery and deep enduring history. Standing in the portico where the General, Charles de Gaulle, a man with an eye for a symbolic moment, was photographed directing operations at the liberation of Paris. Attending a Gregorian Mass, non-Catholics politely requested not to take holy communion on the occasion, but the spectacle open to all. Being privileged to glimpse some of the treasures kept within the Cathedral, many of which will now be lost. After three hours in the fire-fighting, hopes remained that the two main towers of the Cathedral might stand. Late at night in Paris, there were tears and prayers being said in the streets. The building is being mourned for the place it held in the core of the beautiful centre of Paris. Media editor Dr Lee Duffield is an independent journalist and researcher with specialist interests in Europe. He is a former European correspondent with the ABC and an academic. He recalls Notre Dame Cathedral in the forefront and the essential background of visits to Paris over nearly 50 years.